Earlier today, Kellyanne Conway, Counselor to President Trump was interviewed by Chris Cuomo regarding James Comey's interview last night on 20/20. What follows is a partial nonverbal analysis of a crucial portion of that interview. 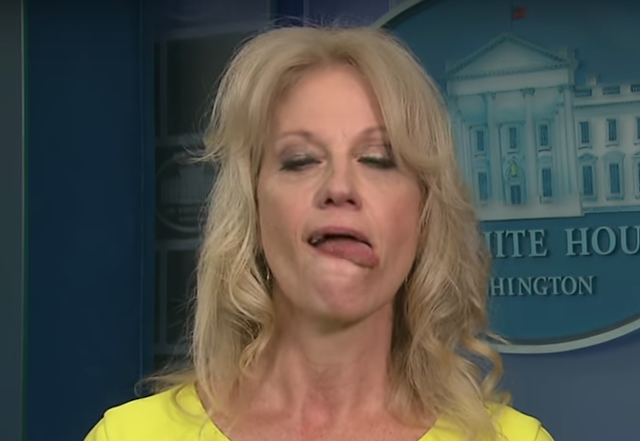 Note that simultaneously Ms. Conway displays a prolonged blink - which, although not required in this context, when clustered with a Loose Tongue Jut, this blocking phenomenon serves as an amplifier for these same feelings. • "... He also admitted Ω that he as FBI director - injected partisan politics ..."
• " 'This guy swung an election? I [feigned stammering] don't think so!' "
(That is, she DOES, in fact, believe that James Comey affected the outcome of the 2016 Presidential election). Body Language Analysis No. 4258: Sarah Huckabee Sanders' reaction to the question: "Has the President at Any Time thought about Stepping Down?" Body Language Analysis No. 3251: (REPOSTING) Donald Trump's Response to the question, "Have you ever asked God for Forgiveness?"